"In all this, Job did not sin by charging God with wrongdoing" (Job 1:22). I have poison ivy rash on my face, arms, and legs. Any of you who have ever had poison ivy are aware of how much it itches. I got it last week when I was weeding in my backyard and I suspect also this last weekend at a men's retreat. We went on a five mile hike down a mountain through the woods. Frankly, I'm pretty miserable! I've had poison ivy many times before, beginning as a kid on a Boy Scout campout as I recall. I sensed when I was weeding I was into some and went in to wash off my hands and face but apparently not soon enough. However, I am aware that this situation, however uncomfortable, will soon pass and that in several days I'll be back to normal. I wonder how I would feel if I had no idea if and when I would ever get relief from this affliction. I consider God's servant Job. Of course his suffering was much, much greater than mine (he lost his wealth, children and health). Throughout the book he had no idea how long he would suffer or if he would ever get relief. Yet he continued to place his faith in God and of course was eventually vindicated. What a powerful perspective of steadfast faith is expressed in the daily text, "In all this, Job did not sin by charging God with wrongdoing." Some of you are facing situations where you just don't see the way out. It may be a health matter, marital conflict, loneliness or other seemingly hopeless situation. The book of Job teaches us that there is always divine activity taking place that we don't see and that God will in His time make a way. He will do the same for you. Keep trusting God today even in the midst of your affliction. "In all this" God will prove Himself dependable and will work things out "for the good of those who love Him, who have been called according to His purpose." In all these things we are more than conquerors through Him who loved us! Today's prayer – Lord, I realize today that many of my brothers and sisters are going through some very hard times. Some of them are in what seems like a dark tunnel of despair and they do not see any light at the end. That sure was a way Job might have felt. Renew our assurance today of your steadfast love and care even in the midst of our trial. Send means of hope and encouragement today to uplift us in our faith. May we see that glorious light that is always at the end of the tunnel. Amen. This song has so often blessed me during a time of trial. "God will make a way"
The blessed truths of Romans 8:28-39 were especially a blessing to me today. This morning I read a very distressing article concerning the persecution Christians are experiencing in the Middle East. Job tried relieve his suffering. He "took a piece of broken pottery and scraped himself with it as he sat among the ashes" (Job 2:8). This makes me wonder if Job's affliction included severe itching! My pastor sent me this photo with a great story. A lady found this fawn under her step (they think the doe might have been hit by a car) .. her Ridge Back dog is helping look after it. 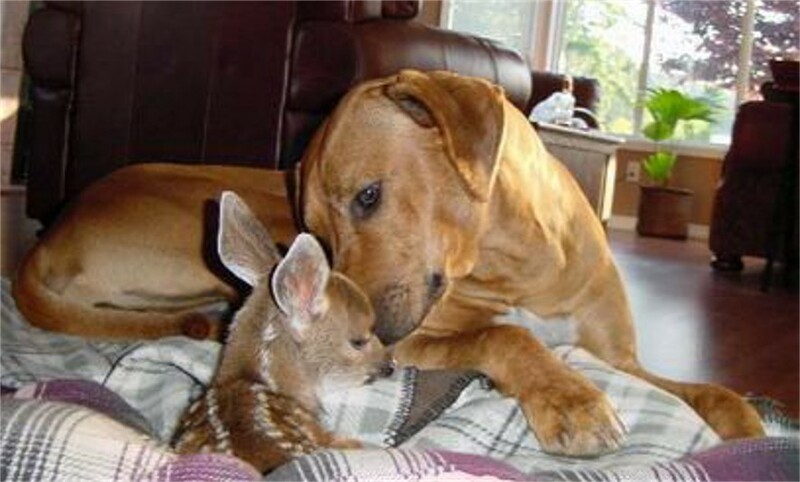 The family named the fawn Bella. Once she has regained her strength (she was not in good shape when the family found her) they are going to send her to some friends who (in the past) raised two orphan deer and released them to the wild. Right now she is being bottle fed. Their dog (Hogan) has basically taken over. The fawn even shares his bed. 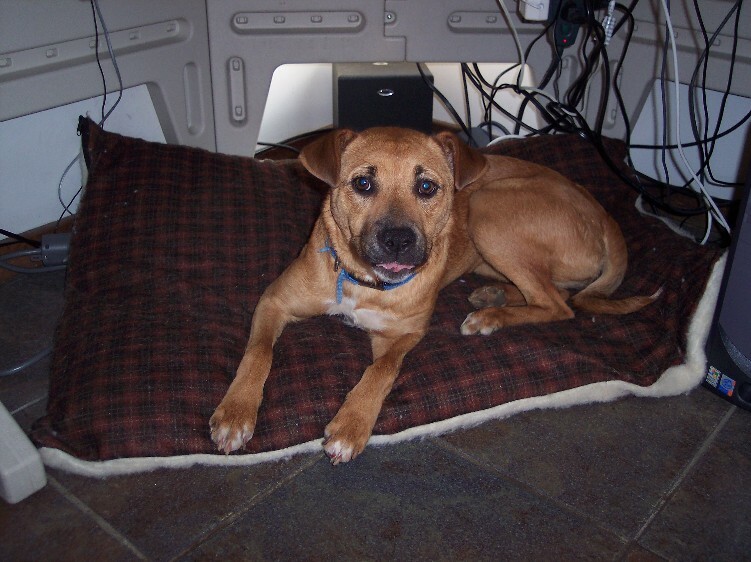 This dog bears a striking resemblance to our dog Roxie, which we were told is part Rhodesian Ridgeback. Here's a photo I took this last Spring right after we got her.